Joe’s is happy to announce that Reunity Resources is picking up used deep-fry oil from Joe’s Dining. Even better I can now buy locally made Bio Diesel from recycled vegetable oil. My GMC 1992 with a 6.5L Turbo Diesel engine has 185000 miles, was feed with Bio Diesel-blend from the Bacca Station for the last few years and now runs smoothly on the B99.9. Lowest emissions: provides a life cycle emissions reduction of 78% compared to petroleum diesel. 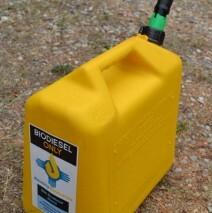 Non-explosive and Non-toxic: unlike gasoline or petroleum products, biodiesel has no dangerous fumes. Locally Sourced: made from recycled vegetable oil collected from locally owned restaurants. Locally Produced: made in New Mexico in a family operated plant. Recycled: not produced from virgin oils often grown at the expense of food crops. Low Carbon Footprint: transported locally in a biodiesel-powered truck. Tested and ASTM Certified: exceeds biodiesel specification D-6751. Engine Performance: similar fuel consumption, horsepower and torque as well as higher cetane and lubricity. No Engine Modification Required: compatible with standard petroleum diesel engines.